In 1890, Henry Faulkner decided to work on a problem that caused suffering in people everyday – foot problems caused by lack of ventilation inside of shoes. For years people constantly complained about blisters and sores on their feet as well as excessive sweating and aching caused by walking and standing with shoes on which offered no cooling air to circulate within. Faulkner devised a method for placing holes in specific locations within the shoe, thus allowing for adequate circulation and greater comfort. 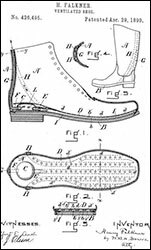 Faulkner patented the ventilated shoe on April 29, 1890 and thereby helped to provide comfort and healthy feet to the world.